When you are making the transition from photography as a hobby to photography as a business there are new things to consider. One of those new things is – what insurance does your business need? Insuring your equipment is straightforward to understand, but not all insurance is that simple. One area that prompts a lot of questions is public liability insurance. It’s not particularly intuitive if you are not familiar with it. Read on for more details on public liability insurance for photographers explained. As outlined in this previous post – public liability insurance protects you and your business against the financial risk of being found liable for negligence. Negligence is causing reasonably foreseeable harm, including injury, death, negligent advice, nervous shock, property damage or pure economic loss. (this definition is from an Australian government website for business). What does that mean for photographers? The major areas of risk for photographers is being found liable for negligence which leads to injury or property damage. As an example, I shoot weddings and at each wedding I carry a bag of equipment. At each location that bag gets put down on the ground. While I try to make sure it is out of the way, it is still possible that a guest (or anyone else) could trip over the bag and injure themselves. If you shoot family portraits in parks or other outdoors locations you have the same risk. If you are shooting functions or parties you might not have a large gear bag with you – but you could knock over a candle which then causes damage at the venue. If you shoot in the studio, there is a risk of clients tripping and falling in your studio. How likely are these events? In the examples I’ve given above, the likelihood of this happening is low. I know many wedding photographers who have shot hundreds of weddings without having an incident. I know studio photographers who have worked with hundreds of clients without ever having an incident. Why take public liability insurance? While the likelihood of something happening is low, if you don’t have insurance, the impact to your photography business can be very high. In fact, it is very likely that it could wipe out your business. Imagine the financial impact (let alone the stress) of being found liable due to negligence for injuries caused to a wedding guest who tripped over your gear bag. Or for fire damage caused at an event venue after you accidentally knocked over a candle. Or for injuries to a client who tripped over the electrical leads in your studio. 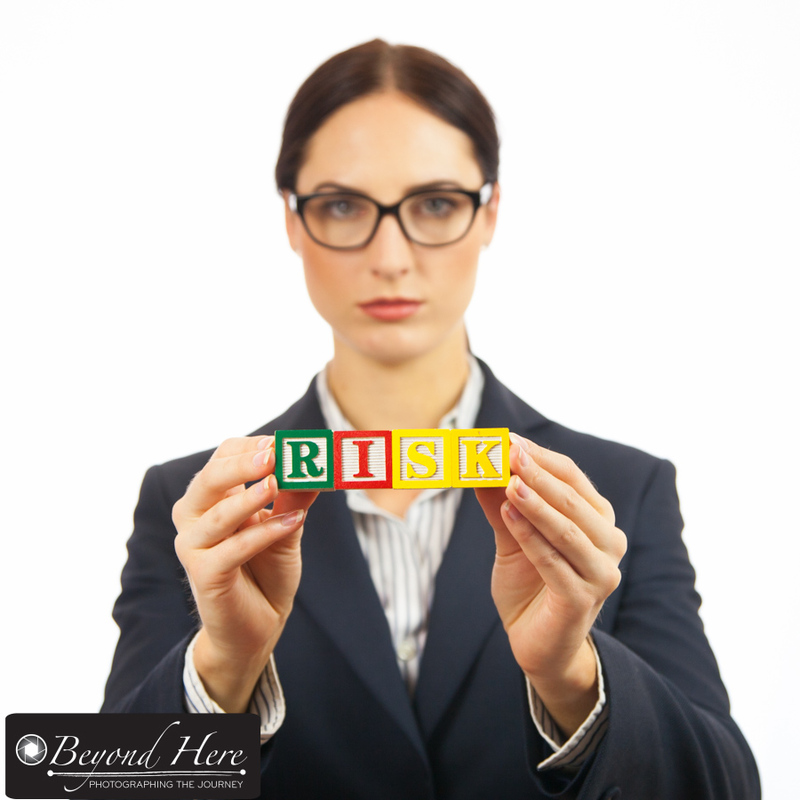 Public liability insurance can protect your business from that risk. Do I really need this? Every photographer will have their own answer to this question. For me, the answer is a resounding yes. I don’t want my photography business wiped out by a stroke of bad luck. It really is not a case of ‘should I or shouldn’t I?’ To me, it is common sense to have public liability insurance. Ironically, I hope to never have to make a claim. That would be the ideal outcome. But in the event that something does happen, it is great peace of mind to know I have appropriate insurance in place to protect my business. What does it cost? The cost of public liability insurance varies according to a range of variables including which country you are in, the size and turnover of your business, the number of employees of your business, the type of work you do, and the amount of cover you want. For me, running a business shooting weddings, family portraits and stock – my public liability insurance is only a few hundred dollars per year. It is well worth the few hundred dollars for the peace of mind to know I am insured appropriately. Thanks for taking the time to read Public Liability Insurance for Photographers Explained. I hope it has been useful for you. Keep in mind I’m a photographer – if you need detailed information relevant to your own business have a chat to an insurance broker or insurance company. Let’s hope we never need to make a claim – but can run our businesses knowing we have the right insurance in place. Happy shooting. This entry was posted in Business Tips on December 11, 2015 by Craig Dingle. How Long Do Stock Photos Keep Selling For? I repeated the exercise I did two months ago, by looking into my most recent one hundred downloads on iStockphoto. In this analysis (see graph below) exactly fifty percent of my current downloads were from files uploaded four to five years ago. A further eighteen percent were uploaded three years ago. This is almost exactly what I found last time I did this analysis (read here for the previous post). I am surprised to see the outcome was the same because one hundred downloads is a small sample size and I didn’t expect to see the same result. For regular readers of Beyond Here you will know that I have written extensively about the changes which have happened at iStockphoto over recent years. One major change has been the implementation of a subscription program for buyers. iStockphoto’s business model has changed to meet the need of these regular buyers. It has changed so much that my own download numbers are now dominated by subscription downloads. So, what if we look at the one hundred most recent subscription downloads? Do we see the same pattern? You can see that analysis in the pie chart below. 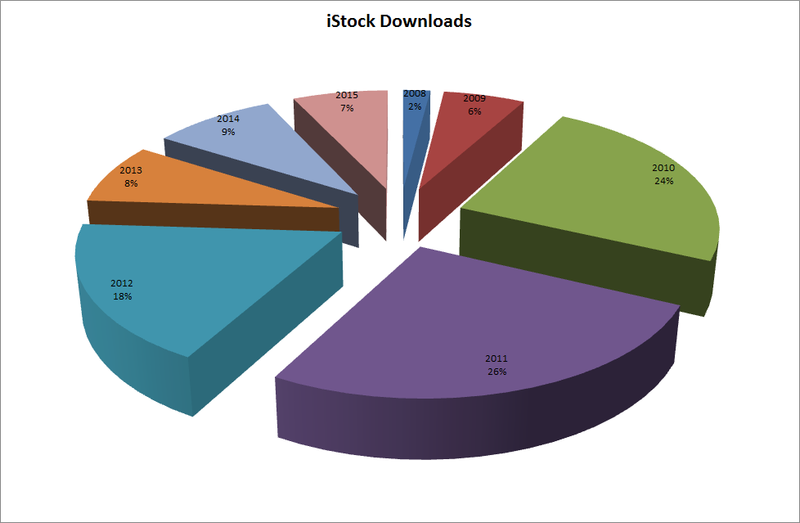 I expected to see a significant difference in the pattern between ‘normal’ iStock downloads and subscriptions but that is not the case. In this case, forty three of the last one hundred downloads were from files uploaded in 2010 and 2011. And a further twenty one from 2012. If I add those together, sixty four percent of my most recent subs downloads were from files uploaded three, four or five years ago. The only noticeable difference between ‘normal’ and subs downloads is the eighteen subs downloads of files uploaded in 2015. That suggests that some of the subscription buyers are looking for new, current imagery. I expect these are very high volume buyers who have a need for different and fresh images. These might be publishing houses, magazines, newspapers or ad agencies. I found it surprising that, aside from the files uploaded in 2015, the pattern in subs and normal downloads was similar. 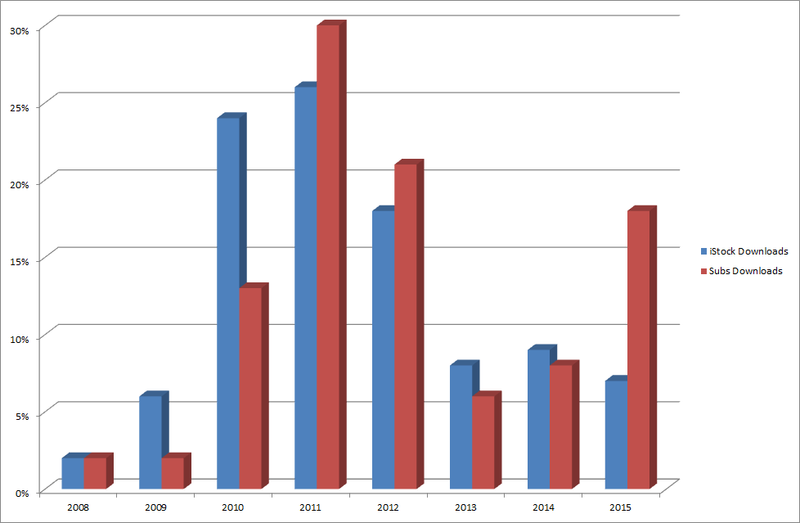 I have presented these in a bar graph below. 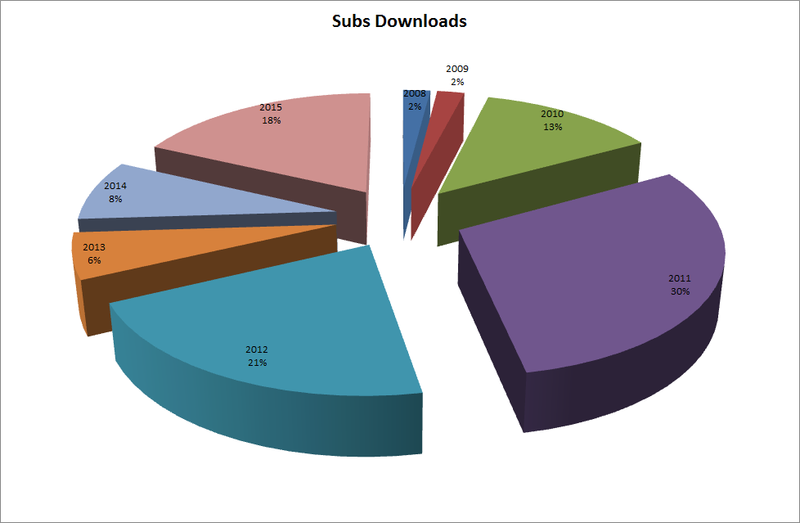 It highlights that files uploaded three, four, and five years ago make up a high percentage of normal and subs downloads. So, what do we learn from this? How long do stock photos keep selling for? Stock photos can continue to produce income for several years. It is worth shooting and uploading regularly to build an asset which will produce income in the future. The subscription program appears to attract a slightly different group of buyers who are more inclined to buy new, fresh content. Please keep in mind that this is just one photographers experience and it is based on analysis of only a small quantity of data. If you are a stock photographer, I’d be interested in hearing about your own experience. Please comment on this post. And if you are new to stock photography, please don’t accept the popular view that it is hard to make money in stock photography. I hope this analysis will help you realize that well composed and executed concepts can continue to produce an income for several years. Thanks for reading ‘how long do stock photos keep selling for?’ I wish you success with your stock photography. Shoot, upload, repeat! Shoot, upload, repeat! This entry was posted in Stock Photography and tagged iStock, microstock photography, stock photography on December 2, 2015 by Craig Dingle.